Photo: Thorn House, ca. 1857, 87 East St. Charles Street, San Andreas, CA. 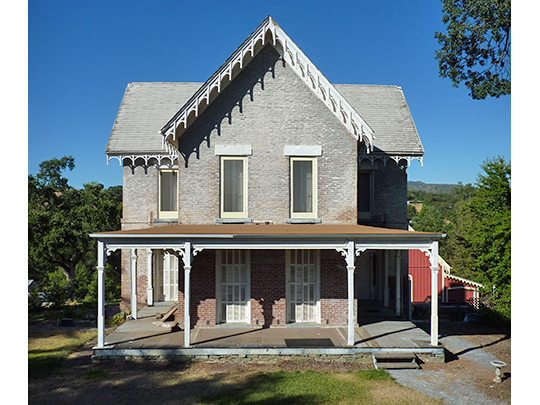 Listed on the National Register of Historic Places in 1972. Photographed by User:Bobak Ha'Eri (own work), 2009, [cc-by-3.0 (creativecommons.org/licenses/by/3.0)], via Wikimedia Commons, accessed February, 2014. Calaveras County administrative offices are located at 891 Mountain Ranch Road, San Andreas, CA 95249; phone: 209-754-6025. County of Calaveras, California, Calaveras County General Plan Update, 2012, http://www.co.calaveras.ca.us, accessed February, 2014.